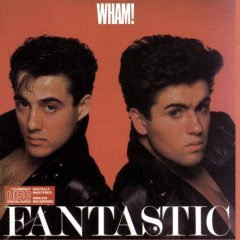 WAIST HIGH: Happy 25th Birthday Fantastic. "The album also features a hidden track (played on a honky tonk piano), which is included in the final 20 seconds of the 'Young Guns (Go For It)' track." "Bad Boys" reached #2 in the UK charts, and became the biggest hit from the album, the full version of "Wham Rap! (Enjoy What You Do)" was almost seven minutes long and went to #8, "Club Tropicana" was the fourth and final single to be taken from the album, and went to #4. Waist High's favorite track from the album, "Young Guns (Go for It)," was the band's first hit and peaked at #3. The song, which George Michael wrote "about a teenage lad's worry that his best friend was getting too committed to a girl when he should have been enjoying his youth and the single life," features the great line, "Death by matrimony." "Young Guns (Go for It)" has a big feature by backing singers Pepsi and Shirlie.